The Wine of Saint Martin’s Day by Pieter Bruegel has preoccupied me since 2009, after coming across it in the fifth Bruegel book I ever purchased. For the most part, the books have the same familiar images—of peasant dances, children at play, allegories, and the winter panoramas—that are the highlights of his painting career in the Netherlands. But the reason I had for collecting them lay in seeing familiar paintings in varying levels of detail. The black and white, or color, images offer slightly differing perspectives on paintings I feel I know well. “The Elder Peter Bruegel” published in 1938 by the Willey Book Company, contained an essay by Aldous Huxley and a new Bruegel painting that I had never seen before. The new painting was titled Feast of St. Martin and the image in the book appeared to be a detail. A complete image of the painting was absent. The black and white detail showed the figure of St. Martin riding a horse and, to his left, a crowd of people in varying levels of drunkenness climbing over each other as they waved, poured, or reached for a jug of wine. After a frustrating and fruitless on-line search to find the rest of the painting, I gave up and decided to begin a drawing transcription of it, using the detail image. Several things struck me about the composition: St. Martin appears to be exiting to the right of the painting leaving the celebration given in his honor. In this detail only two beggars take notice of St. Martin as they reach for him rather than reaching for a jug of wine. To the left are the peasants, climbing over each other, and not appearing particularly happy considering it is a party. Bruegel’s incredible draughtsmanship gives us overlapping forms and movement, setting up a rhythm that moves us from foreground to background to the top of the picture where we see the beginning of a landscape with more folks drinking. Throughout the year that I worked on the drawing, I periodically searched for an image of the entire painting and in 2010 I got lucky. 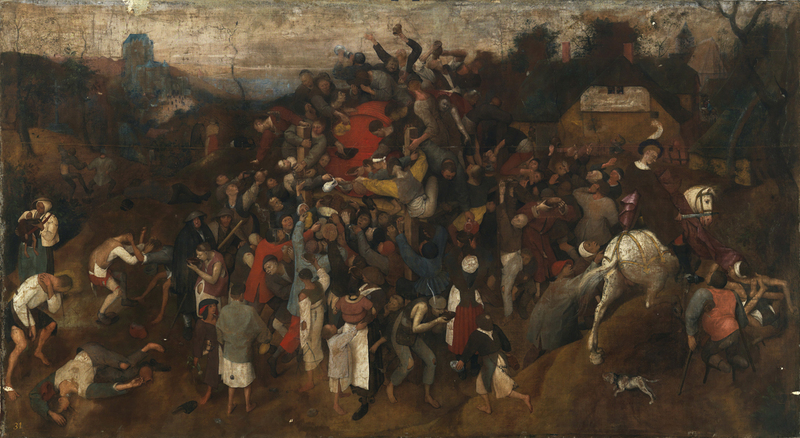 I came across a NY Times article announcing that a new Bruegel had been (re-)discovered. It was the Feast of St. Martin, now titled the Wine of St. Martin’s Day and, for the first time, I was able to see the rest of the painting. How exciting! It turns out that the detail from the Willey book was only one fourth of the painting, and I decided to finish the drawing by adding the remaining three fourths. Since then, the painting has been purchased and restored by the Prado in Madrid. Below is the initial drawing transcription, one of several transcriptions I created. The painting’s unique composition is a departure from the other paintings by Bruegel. For example, in the Procession to Calvary, the landscape dominates the painting and acts as a container for the multiple dramas that unfold. In Wine of St. Martin’s Day, the painting space is compressed, pushing the landscape to the edges of a rectangle that barely contains all the activity within it. Most of the figures are stacked vertically and, as they move up and across, they create a mound of humanity clustered around a wine barrel. The overall effect is that of a pinwheel from which some of the peasants have spun off to land at the edges of the painting where various vignettes unfold. In these, Bruegel gives us social commentary on excess. We see two drunken men engaged in hair pulling, a woman giving a baby a sip of wine, and two men already passed out. As St. Martin prepares to exit the painting there are two additional beggars that approach him from the bottom right corner. In this arrangement of figures Bruegel highlights and gives us the entirety of the miracles attributed to St. Martin of Tours, a Roman soldier born in 316 AD and a convert to Christianity. Here we see the story of St. Martin, as a soldier and a catechumen, riding on his horse and encountering a beggar shivering in the cold. He takes his sword and cuts his cloak in half and gives it to the beggar. That night he dreams that Jesus appears wearing the cloak saying “Here is Martin a Roman soldier, he clothed me.” This highlights his piety. He was also said to have healed the paralytic and both figures approaching him are crippled. Bruegel is a visual anthropologist and by consigning the story of St. Martin of Tours to the lower right of the painting, he shifts the central focal point to his countrymen as they celebrate the Saint’s feast day, which coincides with harvest time, when new wine is ready to be consumed. This is the subject that dominates the painting. Similar to the Procession to Calvary where the Christian story is buried among the many activities of those gathering and traveling to see the crucifixion, the religious aspect is not central to this painting. As is often the case in Bruegel’s work, his countrymen are the real subject matter. Here the gaiety that is found in Peasant Dance is absent and chaos reigns instead. The bird’s eye viewpoint in the painting is fascinating and unsettling. It allows us to look down on the scene, while simultaneously drawing us up to the band of light across the top of the painting’s horizon. In the glow of light we see figures stumbling or dancing home in the distance. Rather than giving us a uniform arrangement of shapes, the painting is populated by distinct and expressive characters. They invite our eyes to dart across the surface, discovering each one, laughing at some, and wincing at others. In The Wine of St. Martin’s Day Bruegel hints at piety run amok; it is a veritable tragic comedy.